On Sunday evening, my sister, her husband, my nephew and I met up with a friend of my husband's who lives in Snohomish, WA. My husband, John, and Drew have known each other through a car forum for about five years but have never met. Interestingly enough, I would be meeting Drew and his wife for the first time. The place: Red Robin in Lynnwood. Drew, his wife and her niece (who was visiting from Portland, OR) were on their way to the restaurant. While we had a brief moment in the parking lot, my sister went into a shoe store nearby, my nephew spent his time blowing bubbles and I simply watched him enjoy such a simple pleasure. When all of us gathered inside, I tried one of Red Robin's signature margaritas. The flavor was very smooth and refreshing; I can hardly tell that there was any alcohol. My sister and I split an apple chicken salad. The portions were so huge, I had plenty and was glad that we shared dinner. The highlight of the night was not only meeting a few great people but Drew brought with him a custom ring made by his friend for John. My husband lost his wedding on Lake Havasu while we were at the little sand bar during Memorial Day weekend. His original ring was titanium, like this custom ring, and cannot be resized after it's heat treated. John lost so much weight cycling that his ring literally flew off his finger and into the lake while trying to put on a hat. No ring could be a better placement than this one. If I understand correctly, the maker wire brushed the metal to give the ring texture and then anodized it (passing electric currents through the metal treated with a special oil) thereby creating a pattern. 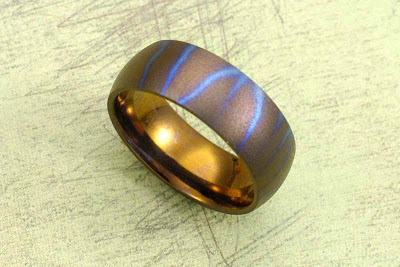 I believe the varying heat temperature gives the ring its color from copper to purple and lightning blue. Drew's friend went the extra mile to polish and round the inside of the ring, then anodized it so it's comfortably smooth. So smooth that when John wears the ring, he can barely tell it's there. No one can be more honored to have such a special gift as a new wedding ring than John and I. Thank you so much, Drew. A wonderful evening to have during this a difficult time for our family. We said our farewells to each other and departed for the hospital to visit our mom before her skin graft surgery the next morning.